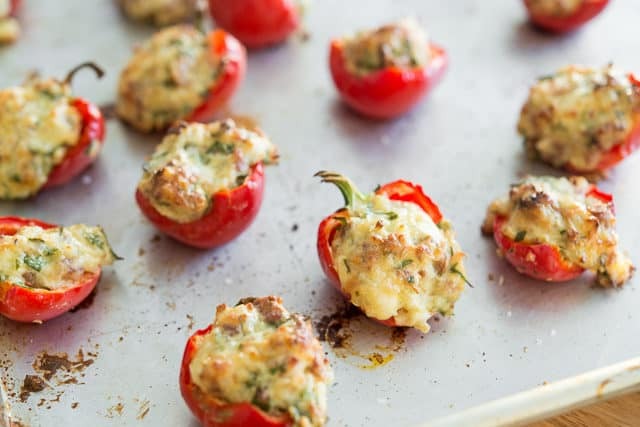 You can think of these Stuffed Cherry Pepper Poppers as like a stuffed mushroom, but with a spicy and flavorful pepper in place of the usual mushroom cap. They’re SO tasty! 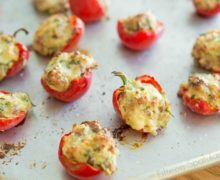 This recipe is a recreation of a dish I had on a recent trip to Miami, where I had cherry peppers stuffed with chorizo and cheese. 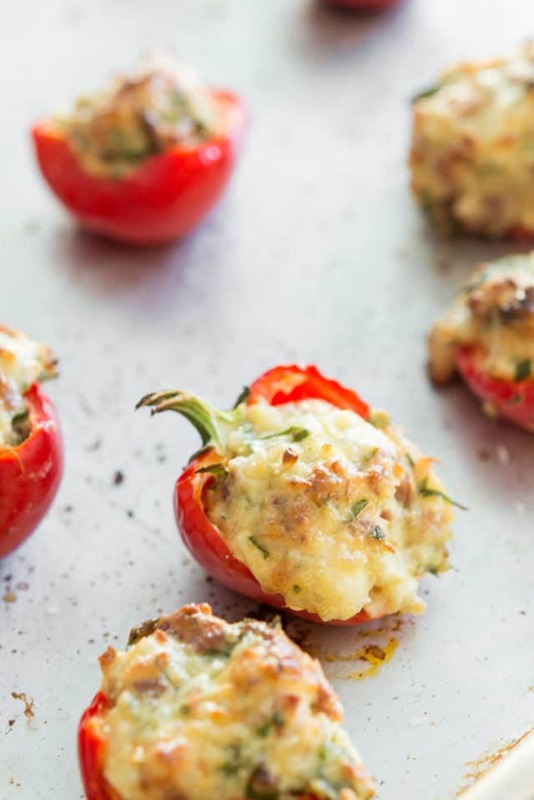 I’ve eaten stuffed mushrooms plenty of times, and I don’t know why I had never thought of doing something similar with peppers. 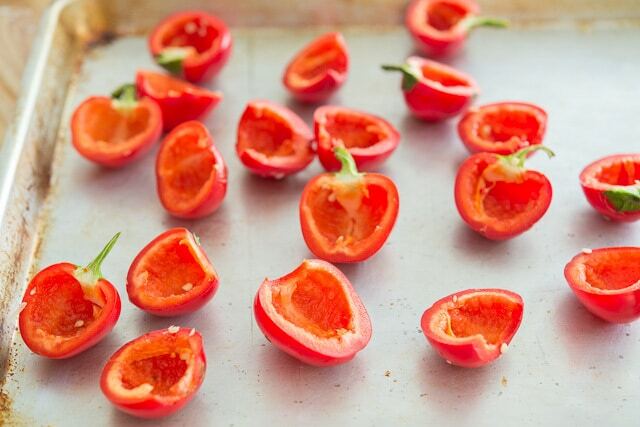 Whenever I see beautiful cherry peppers at the grocery store that are firm and fresh, I buy a bunch of them to make this recipe. 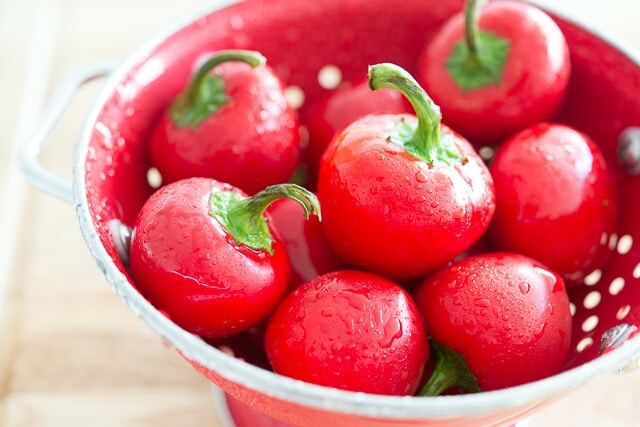 First, a little warning about cherry peppers…they are HOT! And they’re kind of like jalapenos, where sometimes they are not that spicy, but then you randomly get a REALLY spicy one, and there’s absolutely no way to tell until you put one in your mouth. So if you like spicy, proceed, but if you don’t enjoy heat, this might be too spicy for your tastes. (And yes I’m wearing gloves. I always wear them when working with chilies and they help SO much. This is the kind I buy, it’s $6.50 for 500 gloves so they are worth it)! For more vegetable appetizers, I love Stuffed Mushrooms, Zucchini Fritters, Bacon Wrapped Jalapenos, and Chicken Salad in Endive Cups. Enjoy! Heat a skillet over medium high heat. 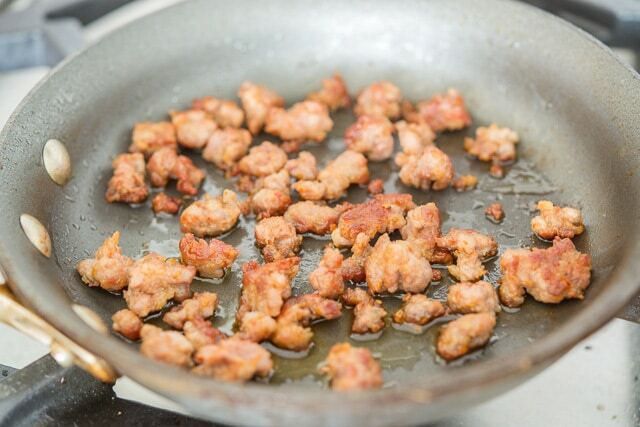 Remove the meat from the sausage casing and crumble the sausage into the pan. Brown for about 5 minutes until cooked through and crispy. 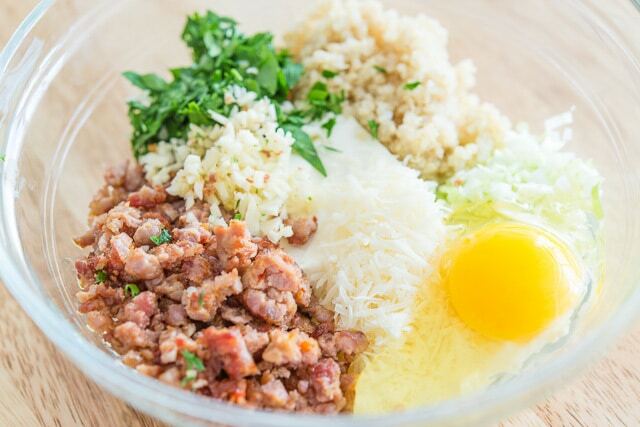 Let cool slightly, then chop into smaller pieces. 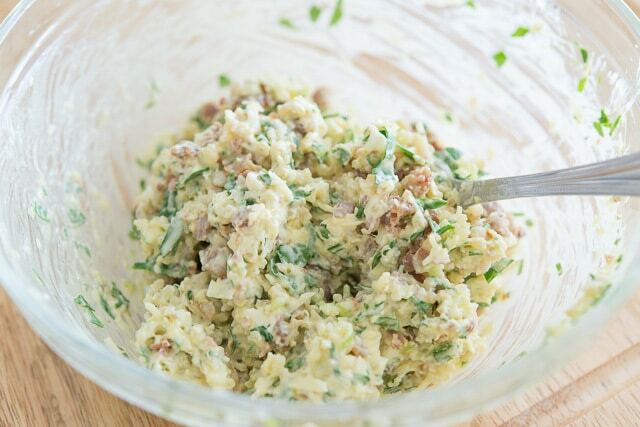 In a large bowl mix to combine the sausage, cream cheese, bread crumbs, parmesan, scallion, parsley, and garlic. Season to taste with salt and pepper, then stir in the egg. 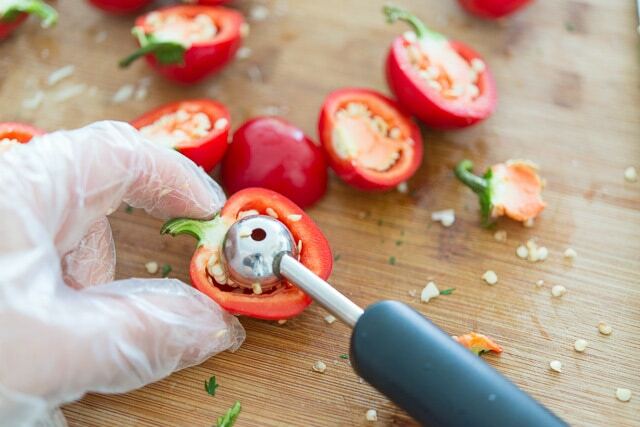 Halve the cherry peppers and remove the seeds and ribs with a melon baller. 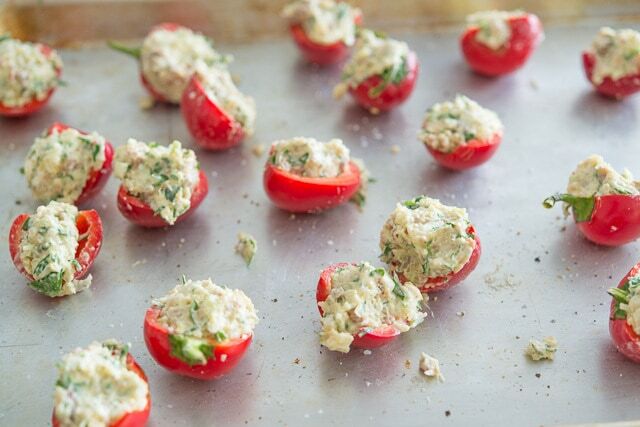 Stuff each cherry pepper with a scoop of the filling. Place on a sheet pan and roast for 20 minutes, until the peppers look softened and the filling is golden brown on top. Enjoy! Post originally published in August 2014, and updated in May 2018 with more photos and writing. This post contains an affiliate link. Hi Judy, glad you enjoyed! i love this recipe i use my apple corer to core the peppers and stuff them whole after the peppers are cooked they freeze great! 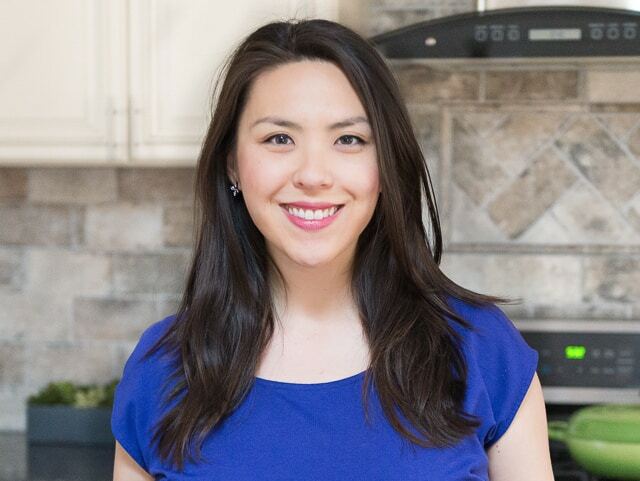 Hi Janet, wonderful to hear, thank you! Apple corer is the way to go!